Children love cute critters, and Super Sticker Activity: Baby Animals will keep them entertained for hours with mazes, coloring pages, and doodling activities featuring fuzzy chicks, little piglets, playful puppies and more! Super Sticker Activity: Dinos is perfect for future paleontologists, who will delight in playing “search and find” with dinosaurs of all shapes and sizes. Each title in the series comes with over 75 super puffy stickers for hands-on fun decorating the colorfully illustrated pages, and the low price point makes them a great gift for any occasion. Whether it’s doodling or a search and find, little ones are sure to find hours of sticker and activity fun! Besides the featured titles above, there are many other titles in the series as well, including holiday favorites too! One VERY LUCKY Nanny to Mommy reader will win Super Sticker Activity: Baby Animals and Super Sticker Activity: Dinos! Entry is simple, just follow the prompts on the Rafflecopter below. Open US only, must be 18+ to enter. Winner chosen via Random.org through Rafflecopter. All winning entries are verified. Please follow us on Facebook to stay up to date with our current giveaways. Good luck! I received complimentary products to provide this post. All opinions are my own. Facebook, Twitter, Pinterest and any other social media are not affiliated with this giveaway. This giveaway is sponsored by Silver Dolphin Books. 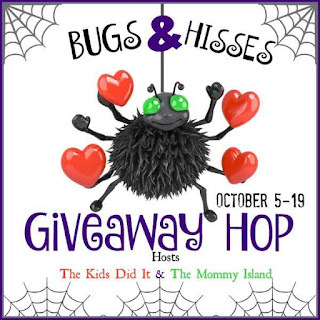 Nanny to Mommy and participating "Bugs & hisses Giveaway Hop" bloggers are not responsible for sponsors who do not fulfill prize obligations. This giveaway is open US/Can, must be 18+ to enter. Cannot be shipped to P.O. boxes. One entry per household/IP address. No social media was involved in this giveaway in any way. Winner is chosen via Random.org through Rafflecopter. ALL winning entries ARE verified. Winner will have 48 hours to respond with all information in email or another winner will be chosen. If you would like to see your product featured on our blog or sponsor a giveaway event, please contact us. Tough call!! They are both adorable!! I think I would prefer the baby animals though, mainly for learning purposes though lol. My son would love the Dinosaur book! What a great giveaway! Hard to choose! They are both cute. Probably would pick the animal one for my daughter! I love the Baby Animals book as my 2 year old grandson loves baby animals. We especially like the Baby Animals book. These would be for our family if I won. I would pick Dino for my great grandson, Eli. If I had to choose one I'd choose the Baby Animals book. These would be for playing with my youngest granddaughter. My kids would probably refer the baby animals, but they like dinosaurs too. my daughter would love the dinosaur one! I would love to win this for my granddaughter. She loves stickers and would love any of them. If I had to choose for her I'd choose the baby animals. Baby animals, this would be for my granddaughters! I like the dinobook. My sweet nephew would love this. I'd love the baby animals one for myself. I'd put them in my notebooks. I would love to win the dinos book and it would be for my nephew if I won. I teach the toddler class for Sunday School. They LOVE stickers. I think they'd love either one, but probably baby animals the best. I'd probably have to choose the Dinos book since I have WAAAY more grandsons than granddaughters. Also, I'd use it for Christmas, and already have presents for the granddaughters. I would like the Dinos for my grandson. One for each of my sticker loving kids - Baby animals for my daughter and dinos for my son! They are both awesome books. My grandkids would love them both! I would have to pick the Baby Animals book. We all love animals!! I would like the Dinos book. I would give it to my nephews. I would go with the Dino book. I would give them to my nephews. 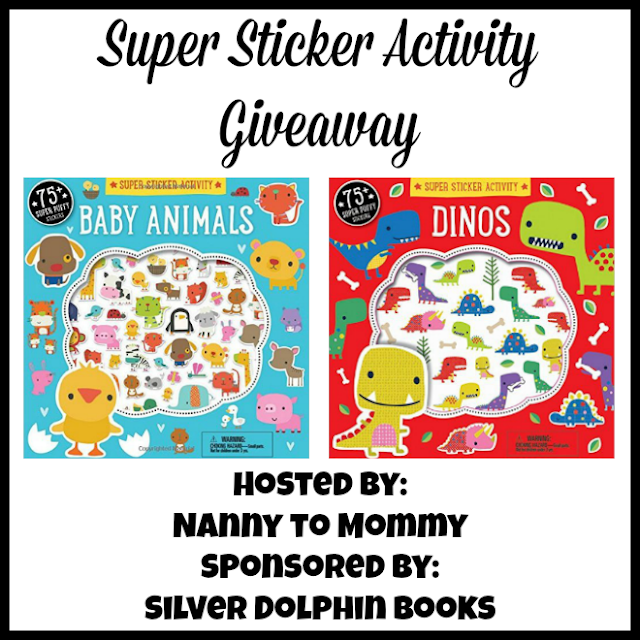 I would love to win the Dino Sticker book for my grandson. I would love the baby animals one for my daughter! We actually already have the dinosaur one. I would love to win the Super Sticky Activity: Baby Animals for my son.